However I had one thing to deal with that has nothing to do with all the sudden changes, preparing drawing props for the fall. These will be put into use in my new 2D class, though I would have needed them anyway for my Basic Drawing class, still on the schedule. 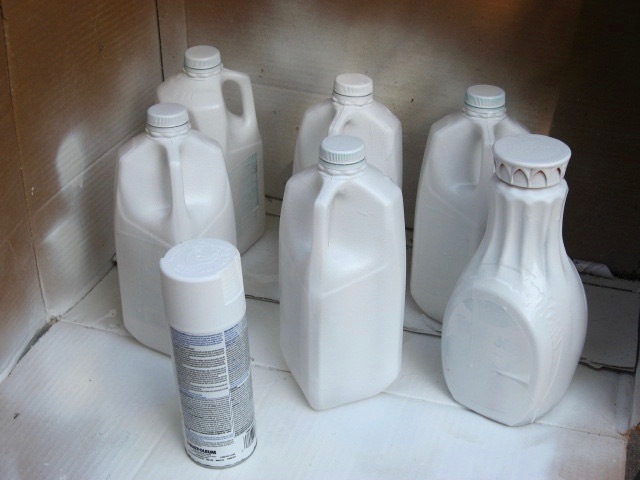 So this afternoon I brought bunch of empty plastic bottles down to my parents' house, where I keep all my spray painting stuff. Set up my temporary spray booth and got a coat of white on several objects, the above ones plus one other. Some touch up will be needed, but this gets my supply of drawing props closer to where I need it for the fall. 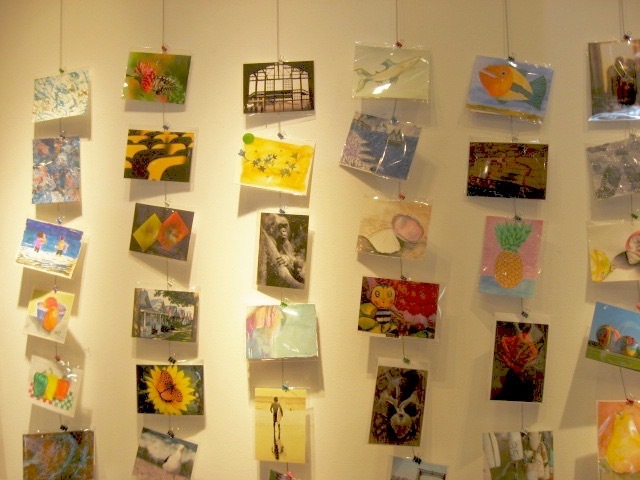 Received an e-mail today announcing the demise of Arts Guild New Jersey. 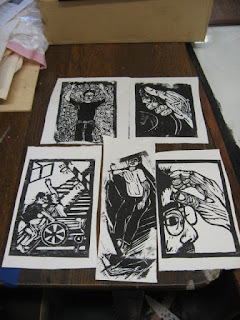 I first came to know the place when I participated in a relief print show there in 2009. Never was quite sure the original purpose of the building (looked like it could have been a church or a library), but along the way it had become the Rahway Arts Guild, a simple trip from the Parkway. The person who curated that show later put me in another relief print show, this one in Newark. The next time I was back in Rahway was for a shore related show. Curator Doug Ferrari (who I had met back in the 90's while investigating local colleges) had been the director of SICA, a non-profit arts center in Long Branch that I might check out a few times year. They occupied a large former industrial building that had been home to many businesses over the past century. Now it had a large gallery space, a small cafe/performance space, and individual artist studios for rent. 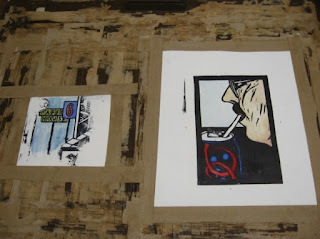 A few people who would later become regulars at the Critique held in the Studio worked there. When Ocean County College built a new art building and officially cast off all the old printmaking equipment, SICA received the donation. The plan was to create a print center, but before that could happen, SICA lost the building. They relocated the gallery to Asbury Park, a place I helped to fix up. About a year later, that place was gone, too. Just before it closed Doug asked me for images, planning to put together a show of shore artists at a location up north. 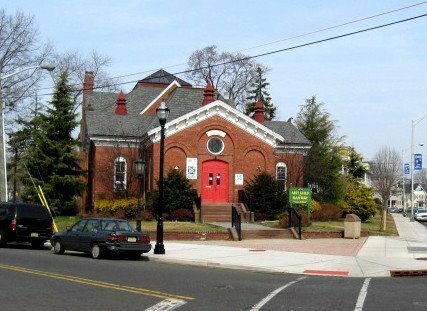 He turned up as the new assistant at the space in Rahway, now renamed Arts Guild New Jersey. And that show occurred in 2013. This all put me on their e-mail list, so I've been getting regular information about class schedules, exhibitions, etc. Today's e-mail just said that's it, we're done. Lost their lease, everything planned for September is cancelled. Perhaps they'll reconstitute in another location, and if so, they have my contact info. Though I do have to wonder about Doug's future. I think he's always done an excellent job as a curator, but the locations have had some bad luck. Art is a tough business. Once again had some time in the afternoon, so I decided I may as well deal with the Selfie project. Had nothing to do that I couldn't have done at home, but working at the big table in the Studio is much easier. I had spent enough time looking at the pieces that I was pretty sure the idea would work, but before I cut anything, I figured it wouldn't hurt to check. So I took a piece of old copy paper (actually an old syllabus from drawing class) and traced the shape of the space to be filled- just to the left of my profile. The high contrast black and white made this easy to do. Used an x-acto knife to cut out the negative space, and placed it over the signs print. Yes, that will do. The space is an irregular shape, and none of the signs is completely visible, and there were a few pieces of other bits of the tower print now visible in the space. The right most vertical line is actually a piece of tower architecture, but I figured it could pass for another sign pole. A little sliver of the ESSO sign from the tower print is visible, but not enough for anyone to know what it is. Was able to cover up some stuff along the bottom part (again, bits from the tower print) with some green watercolor, which could be tree tops or some other kind of plant life. Touched up some other colors as well- metal glasses frames, skin tones, etc. I think it's done now. Results are below. The show applications are due in early September, so I have time to make adjustments if I need to. Right now my working title is "June 8, 1994, somewhere along I-64." As I wrote yesterday, the soda can design is made up. The two background signs are partly obscured, but anyone who has spent time on the highways of the south and midwest will recognize them. Spent much of the day doing physical labor and errands, but in the late afternoon I was able to get up to the Studio to continue on the Selfies project. Grabbled the watercolors I had at home, my newly printed fragment, and the board I had taped the main piece to, and got up there by around 3 pm. First step was to tape the new fragment to the board in preparation for coloring. Then I started coloring the first piece. Just put a basic skin tone down for now, with a few bits of color blended in. Went with red and blue for the colors on the cola can. 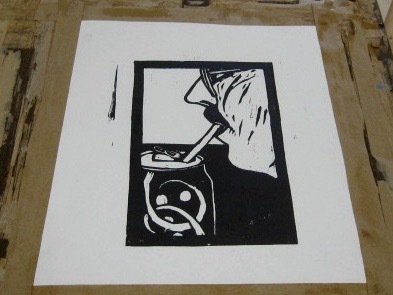 The design is not meant to evoke any particular brand, but just to represent a generic no-name brand of cola. Red and blue seemed common enough colors. Had a little more trouble with the second piece. Not in deciding the colors, which are based on well established commercial logos, but in the process of coloring. Though printed a few days ago, and that ink was dry to the touch, it started to dissolve into the watercolor. (Speedball is really a poor quality ink) Did a little touch up, and I can do more if needed after I put it all together, but this will probably be fine. 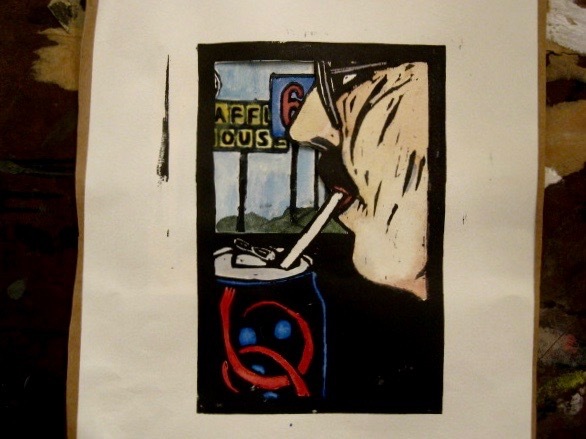 After all, I want it to read as distant background, and sit back behind the face and soda can. The next step can wait for another day. Took the past several days off, a combination of work and having our weekly heat wave and the need to remain air conditioned. so here are some updates. Last week I dropped by the Boatworks to photograph the latest version of the Art on the Line show, and received a little gift. There was some cleaning and organizing going on, and Rebecca offered me a few items- three small tubes of water based relief ink, two small wooden spoons, and some sand paper. 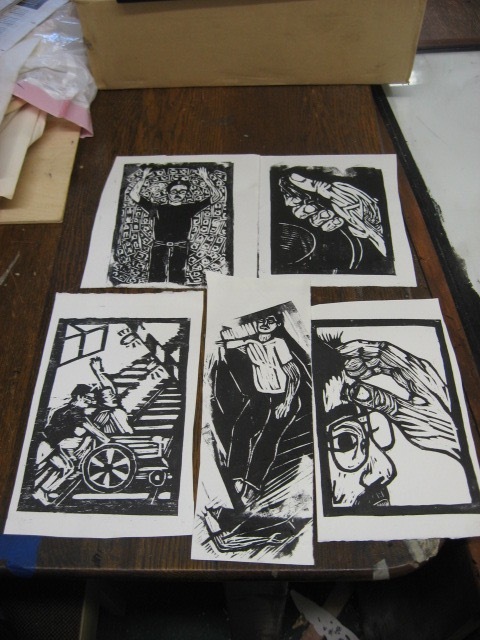 I generally don't use the water based ink in my own art, though back when I was teaching 2D regularly I was using it to print student woodcuts. 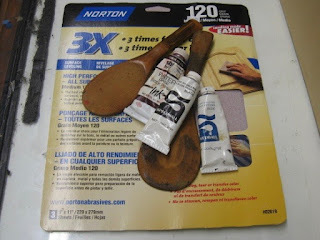 However extra wooden spoons are always useful for class printing projects, and sandpaper never goes to waste. I didn't expect that any of this could be useful right away, but art can be unpredictable. I am currently working on my contribution to the BAC Selfies show. Where I left off last week was learning that I couldn't use an image of tall roadside advertising signs (a print from my Fourth of July series, the block a victim of Sandy) to fill a space from an old print (same series) in making a new collaged piece, figuring I would just make something new. I gave some thought to exactly what signs I might create for this new piece and then remembered I might have another source already done. Several years ago I did a large piece called A History of Art, which celebrated all the things that I had been exposed to, and had consequently turned up in my art. The super tall highway signs included all kinds of bold graphics as well as being an iconic symbol, so qualified on that basis, plus having been used as an image in something I had actually done. 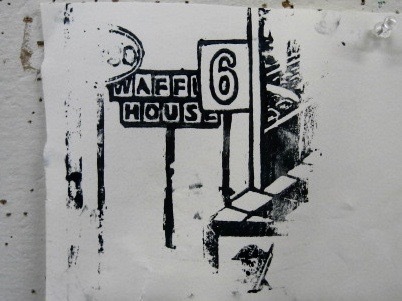 So I included a typical gas/food/lodging combo in this 2008 print. I knew I still had that block, figured the scale of the items would fit my intentions for this new collage piece, so planned to proof this section as collage material, on a day when I wasn't working and it wasn't 110 degrees. Plus, I was able to use my newly acquired art materials. Rolled out a combination of blue and black relief ink, and inked that section of the tower block. Used some tape to mask the background between the poles, and used one of the new wooden spoons to print it onto a scrap of paper. Made two, the better of which is shown below. One good thing about water based ink is that it dries fast, so I can try coloring this piece as soon as I have time. The space these signs will have to fit into is small, leaving room for only two of them, but that's fine. While the ESSO sign made sense in an artwork about the past, the whole chain was converted to EXXON stations by the early 70's (wikipedia has the whole story if you aren't old enough to remember those days) so it makes no sense in a 90's based "selfie". The Selfies show in Belmar isn't for several weeks yet, but whatever I submit will require some work, so I figured today was a good day to do some of it. One of the options I am considering is taking the above print, adding some fresh background behind the face, and popping it into a frame. This image is from my Fourth of July series, the idea of me on the way back to Illinois. Thinking about it recently I was considering making use of another print in the series set on that road, showing a cluster of super tall signs for hotel/fast food/gasoline chains, not typical here in New Jersey, but common enough in the wide open midwest. I figured I'd proof it today, and after it dried a few days, color it. 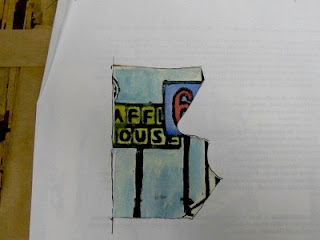 Then cut it up and collage it into this piece. Unfortunately, when I got up to the Studio I found that the highway signs image is one of the blocks that I no longer have. So for today I just taped this recent proof in place on a board, which I would have to do anyway, and perhaps I'll find a way to use the sign idea in the watercolors I intend to add to this one. With nothing more I could do on that today, I continued south to Belmar to shoot some of the latest incarnation of the Art on a Line show. The initial event was about a week and a half ago, but I had to work elsewhere that night and couldn't make it. They ended up with a huge number of donated pieces, so things that didn't sell that first night were left on the lines, now installed on the walls after the solo show in the back room was taken down. There are now about 150 pieces. Don't see the two that I had donated, so I guess mine were sold before. I believe that these will be up through September 9th (unless they all sell before then) when they will need to make room for that Selfies show. The Art on the Line show in Belmar is still in progress; they had over 200 donations, so some were up for the reception on the weekend, and another batch will be up this coming week when the solo show in the back room comes down. Which means it's time to start getting ready for the next show in Belmar. The September show is called Selfies, and if this causes you to groan, you're not alone. Arts people all over have decided this is the only way to get some people involved in art. Last fall my university decided to devote one of its art spaces to a selfies themed show, which was photos of people wearing college clothes or by college landmarks. And then they extended the run of that show, because I guess there was no art being made anywhere else in the world. Last year one of the networks launched a sitcom with the same name, a critique of the kind of people who spend way too much time taking photos of themselves to post on the web and to send to everyone they know. The show had two stars with known audiences, but viewers stayed away. So I shuddered when this show was announced in early 2016. I assume that we will get plenty of submissions of images texted to us from cell phone cameras, but I was relieved to know that all media are welcomed. Part of that is because my cell phone lacks a camera. (for the moment, my phone is a phone, and my camera is a camera, and that's the way I like it) However, I do have a large collection of self portraits in woodcut form, thanks to my Fourth of July series. even with half of those blocks destroyed, I still have lots to work with. Spent most of this week finishing up my summer class, but I was off today and got up to the Studio shortly before noon. I went through my boxes of blocks, selecting about 10 to start, and later cutting it down. My plan was to do some printing, and figure out what to do with the proofs later. The only one that I pulled thinking it might be used as a whole was the above image. 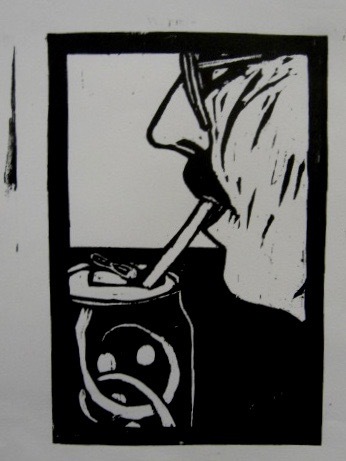 Me enjoying a soda from a rest stop on my way back to campus following my spring trip to New Jersey. Simple composition, easy to read, room to add more stuff (will get color for sure). After that, I pulled proofs of a bunch of images set in the midwest. After they dry, my plan is to cut them up, make some kind of collage, add some color, etc. Digital submissions aren't due until early September, so I have time to work this stuff out. About a week ago I realized that we were getting close to August, and we had skipped the July critique, as the first Monday happened to be the Fourth of July, and no one would be coming in that day. Hadn't seen Molly since the beginning of June, so I left her a voice mail asking what she wanted to do. She called back a few days ago and said she was back in the area and wanted to have the crit, so I did my best to put the word out. Complicating things was that the e-mail account I use to send out these reminders switched to a new server, wiping out the address book I had all the addresses on. Plus, this new system doesn't seem to list all the sent addresses from the old mails. So I put together a list as best I could from here and there, and sent it to 9 or 10 people. One replied, so I knew it did get out. Got up to the Studio late in the day, figuring I could take advantage of my big table and some relative cool to work on some grading, as my summer class is drawing to a close soon. About an hour before the event Molly stopped by. Picked up a few things, announced she had decided to do something else and would not be attending. I continued my grading. Shortly before 7 we had our second person show, Tim, one our longest regulars. 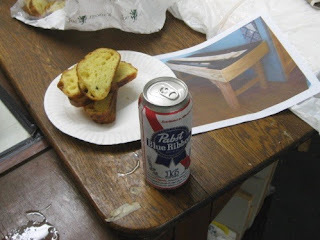 Not much art to show, but he did have some beer, and I had brought a loaf of the cheese bread that most people like. Unfortunately, that was all who showed up. Tim had a small painting to show, and I had brought with me a printed photo of the sink I had built for Mary, the one thing I've had time to make so far this summer. And we chatted about life, art, etc. No one else showed, so a little past 8 I decided to wrap things up.